At least I didn’t as of two days ago. And that’s exactly why this review might be exactly what you need if you have no clue about webinars but need to catch a clue, and quick. That’s what we did, and we sold out the 20 spots for $3,000 apiece. When you’ve got $60K in your pocket you can afford to build a nice course. I like this method much better than trying to figure out how to get tens of thousands of value into a course, launching it, and only then discovering no one wants to buy it. If you want the whole story here’s more detail on how to pre-sell a course. Now that we had the students for our course, and the money to do it the right way, how should we get started? Yes, literally, that’s the discussion that took place. We sold the course before we had any idea what we would do on Day 1. Alright, we’re going to do a webinar. Umm, using what software? This webinar would be one-way in terms of video and audio. I would speak and show my face, but nobody else would talk or show their video. I needed to be able to record the entire webinar in HD so I could upload the file to a Facebook group afterward. People would need to have an easy way to send me questions via chat during the webinar. I needed to be able to switch to show my screen easily to look at websites and such. I needed it to be super easy for people to join the webinar. My marketing agency, MWI, uses GoToMeeting extensively, so I’ve got a bit of experience with it. It’s ok, but I’ve always felt that it was a bit clunky. I’m not sure how else to explain it, other than to say that while I like it, I’m not in love with it. I’ve also had issues inviting people to use it who have never used it before, and I wanted to make this super easy for people. So while GoToMeeting wasn’t eliminated, I wasn’t eager to use it. Also, I wanted to try something else out, since I had heard so much about other products. I’ve been using Zoom for one-on-one interviews I’m doing for Influence Summit, and it has worked very well for this. I especially like that I can record in HD, and record locally. That is, while I’m doing an interview the video is being recorded straight to my machine. This may not be a huge deal if you’ve got amazing internet, but I live in China, there are internet issues here, and so recording locally is a big deal for me. Also, I had found Zoom easy to use with others, I just send them a link, they click on it, and they’re in. Nobody seems to have difficulties getting into the “interview room” with me. I’ve done 20+ interviews for this summit so far with only one glitch. I knew I preferred Zoom to GoToMeeting, but still wanted to play the field and research other options. I get Michael Port‘s email newsletter, and he recently sent one out talking about how much he loved WebinarNinja, so I decided to try it out. Unfortunately, only 4.0 was available as of my search, and 4.0 doesn’t record in HD, so that was a deal breaker for me, right there. 5.0 will record in HD and is coming out soon, so I’ll be curious to try it out when it launches. I had heard a lot of great things about WebinarJam and it seems like everyone uses it, so I was excited to try it out. However, as I started to get into it I started learning that it connects to YouTube and there are all sorts of features I didn’t need. I just need to be able to talk on video, show a webpage or a few slides, and record the whole thing in HD and end up with a file at the end. WebinarJam just wasn’t quite as straightforward as I would have liked. Zoom. Because I had limited experience and I already knew Zoom was simple, it seemed like the logical choice. It was great! Zoom worked flawlessly, just as I wanted, with one minor exception–the screen I use is super high resolution, and Zoom’s video recording isn’t quite that large, so the video that ended up getting recorded has black all around it as a border. Perhaps there is a setting I can change to fix this, but it’s not that big of a deal anyway. Regardless of this small thing, it was clear to me during and after the webinar that Zoom was the right solution for my simple needs. That said, because my needs were quite specific I’m not 100% sold on Zoom for all situations. 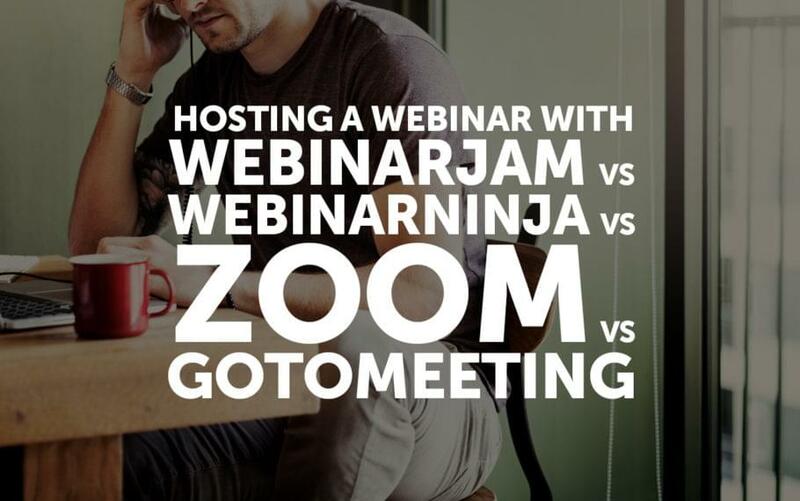 If I were doing more of a sales webinar with 400 people tuning in, I might prefer something else, and even though I went with Zoom for this one, I’m going to now take a closer look at WebinarJam for use in other types of webinars, and I’m still excited to see what WebinarNinja can do once they release 5.0. What webinar software do you use? What else should I try? What experiences can you share, positive or negative?